Against wheat, the pink feels different–still cheering, still vibrant, still eye-catching, still contrasting…and yet, quieter. Translated into makeup, this suggests ways to use hot pinks–to deploy them, if you will, with all of their mood-lifting gorgeousness!–in different contexts, so that maybe we can enjoy them on all sorts of occasions with abandon. I don’t think anyone would dispute that pink can be elegant, but when I think of “elegant pink,” the phrase, all together, frankly my mind does not immediately flit to hot pink or its relatives (fuchsia, magenta…). If you were to say “elegant pink” to me, first I would say, “Oh my, if we have not met before, I’m glad we’ve met now! Tell me about yourself!” But leaving that aside, the image in my mind of this “elegant pink” would be more like…dead serious…the Mariinsky Theater/Kirov Ballet company’s production of the Nutcracker. (You’ll have to fast-forward past the orchestra’s overture to get to some color.) Do you see what I mean? Gar! 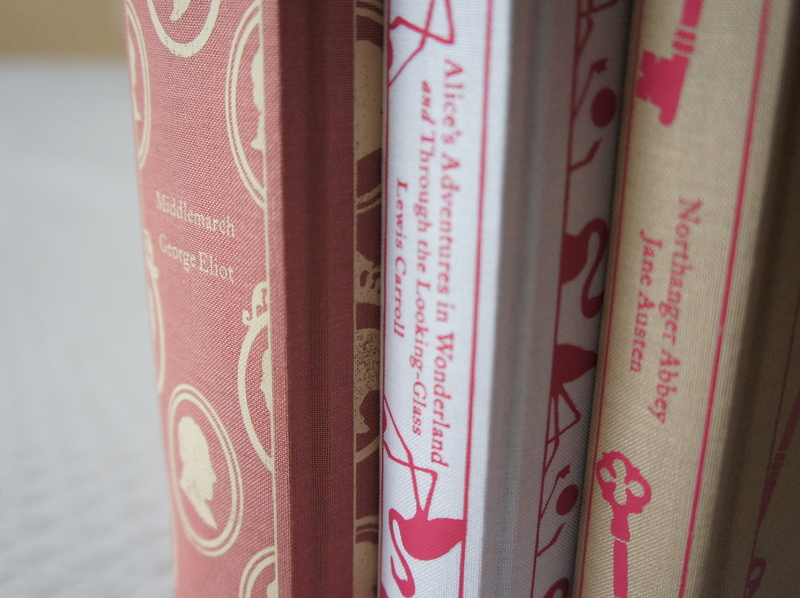 Those warm, blushing, transparent peachy pinks! They drive me mad with their elegance. To tell you the truth, the very first thing that sprung to mind when you said “elegant pink” to me was a warm, blush-pink shade, contrasted with ivory trim, painted up on the walls of the Vaganova Ballet Academy (the training ground for the Kirov), that I saw in a photo essay once. I looked for an image for you, but could not find it. Perhaps it’s best, because that blushing-warm Russian pink has haunted me for years. Anyway, with this as a reference point, well, you can imagine why hot pink, as such, does not immediately occur to me as elegant. I’m not saying it isn’t–I’m about to make a case for its elegance! But I wanted you to know where I was coming from, headwise. OK, enough of my chitter-chatter pitter-patter. Let’s imagine how we could translate the impression of this cover into makeup shades! The cloth background of this cover appeals to me so much because it seems very neutral to me–there is warm brown in it, but the brown is countered by just as much cool gray. That balance between warmth and coolness holds such an intense attraction, at least to me. 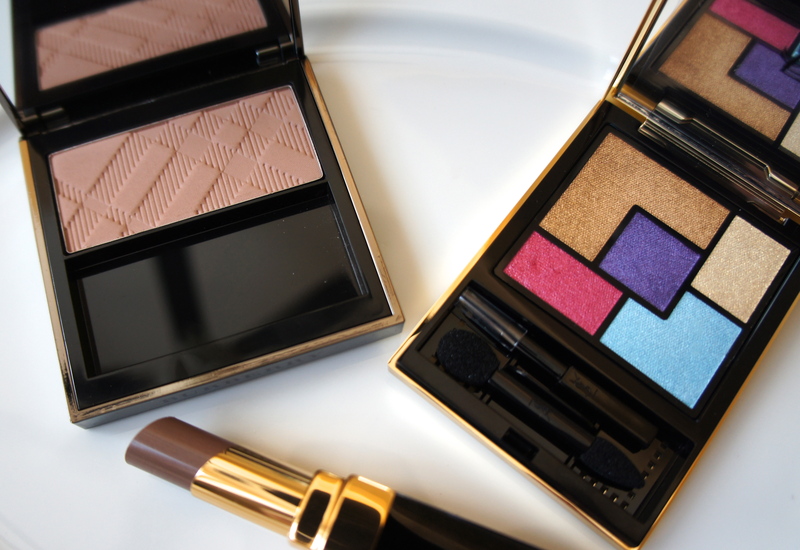 I think that balance is the underlying force behind the attraction of Burberry’s range of eyeshadow singles. I can’t think of a single one that doesn’t have a trace of warmth, a trace of coolness, all held in balance. The same is true for many, if not all, Chanel JC blushers–Rose Initial, for instance, seems to balance on a ballet pointe between warmth and coolness, much like the Russian pinks that leave me feeling so heady. With that in mind, it seemed right to me that the Burberry eyeshadow single, Pale Barley, should be the foundation of this look. Maybe it would end up seeming to fade into the background against lips and cheeks. In fact–just like the wheat-y shade of the cloth in this cover–the eye shade would be the foundation on which the pinks could stand and be, well…another version of their hot-pink selves, in a way. A supremely elegant version of their pink selves, with playfulness and fun present and accounted for…but toned down just a little bit when contrasted with wheat instead of white. 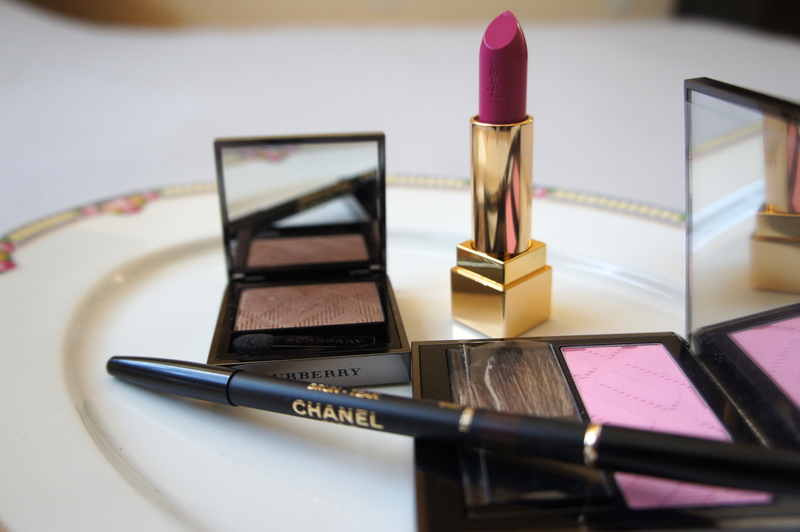 From the left, Burberry eyeshadow single in Pale Barley; YSL Rouge Pur Couture lipstick 19 IFuchsia); Burberry blusher in Peony; Chanel Le Crayon Yeux in Brun Teak (foreground). Lately I’ve been exploring more neutral colors in makeup, because I find that balance both captivating and very easy to wear. I do love Pale Barley–the powder quality is really excellent, so creamy and blend-able and lustrous. At the same time, though, I love cream shadows. And I especially love the Shiseido line of cream shadows for their blend-able texture, long wear times, and color payoff. In recent months I’ve accumulated a few Shiseido cream shadows, and one that I find especially interesting and is Meadow, a mid-tone neutral that might be described as a cool (and rather dark?) antique gold, but might also be described as a winter-grass sort of shade. I thought I might propose it as–not a replacement for the really rather incomparable Pale Barley–but as a kind of cream alternative that gives a similar impression. It is the neutral-ness…the balance…that sings to me in its way. In any event, I think that Meadow can look really pretty on the lids, and it seems to be so quiet that it often goes unnoticed, so I thought I’d mention it. For this look, I thought it might be nice to combine the cream shadow–a little less lush, ironically, than pale barley–with a thin black line along the upper lash line. Lips and cheeks are the same. 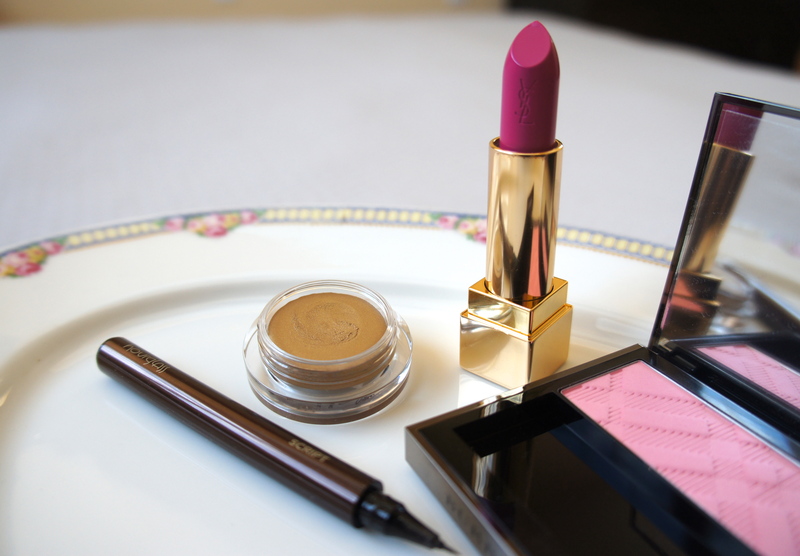 From the left, Hourglass Script Precision Liquid Liner; Shiseido Shimmering Cream eyeshadow in Meadow; YSL Rouge Pur Couture 19 (Fuchsia); Burberry blusher in Peony. So far, we’ve looked at what seem like the clear path here (at least to me)–a neutral eye and vibrant pink cheeks and lips for this look. But what if we took it in a different direction, just this time? What if we flipped everything on its head, and wore a vivid pink shadow on the eyes, maybe in a shape just a bit more dramatic and defined than my usual hazy cloud, and left the cheeks and lips neutral? And not warm neutrals, either, but neutrals leaning a bit cool! The Burberry blusher in Earthy is very nice as a subtle contour for fair-skinned people, precisely because it’s got a touch of gray in it, mimicking natural shadows on the face. This Chanel RCS lipstick is a true taupe without a hint of pink or peach in it, at least not to my eye. It’s effect on the lips is to tone down their natural rosiness…and isn’t that the effect of this cloth cover on our hot-pink keys? I don’t think it would be easy for me to pull off something like this, but our cover inspiration makes me wonder–should I try it? Just for fun? Just to see? From the left, Burberry blusher in Earthy; YSL Couture Palette 11 (Ballet Russes); Chanel Rouge Coco Shine lipstick in Chic. 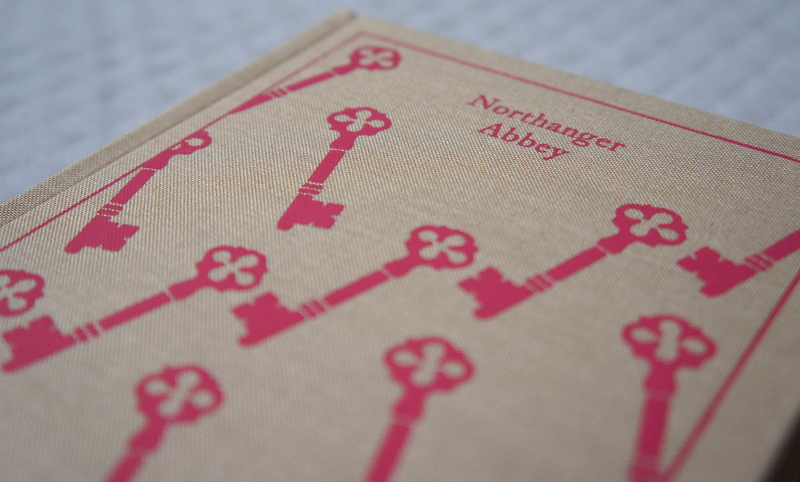 And that is the final post in this little series, inspired by the covers of three Penguin Hardcover Classics. It’s been a little bit of a shamble, but it was so nice to look at some of the things lurking around in the corners of my stash in a new way. Thanks so much for looking and reading, and I wish you all a lovely day.